While in prison, he witnessed to the guards. One of the guards had adopted a blind girl and asked Valentine if his God could help the daughter see again. Valentine prayed and the girl was given her sight. The guard and his whole familly believed in Jesus and were baptised. Valentine fell in love with the girl. When the emperor heard about Valentine making converts in prison, he was furious and had Valentine beheaded. The ruler of Rome, Emperor Claudius, thought there were many gods, but a man named Valentine told people that Jesus is the one true God. This made the Emperor Claudius very angry so he had Valentine put in jail. But even in jail, Valentine kept telling people about Jesus. 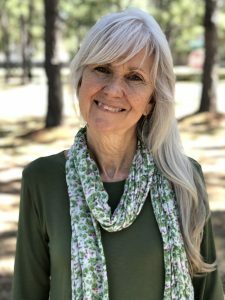 The guard in the prison had a blind daughter and he asked Valentine if God could heal her. 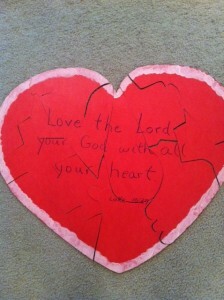 Valentine prayed for her and God caused her to see again. The guard and his whole family believed in Jesus after that. 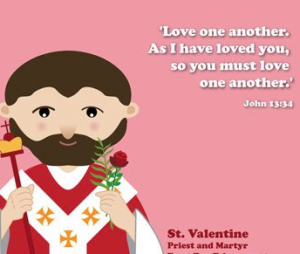 Because Valentine loved Jesus so much, the Catholic church named him a ‘saint’ which is what someone is called that loves Jesus and cares about others. Each year we think about those we love and send them Valentines. Let’s remember that that the first Valentine was sent by a man who loved Jesus very much. 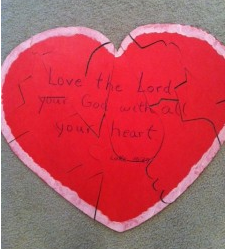 Make a giant heart out of red poster board. Write Luke 10:27 Love the Lord your God with all your heart on the heart. Cut it into age-appropriate puzzle pieces. As you put each piece together say, “that’s not all my heart” until the puzzle is finished. Then read the verse and encourage the child to say, “God, I love you with all my heart”. If you have several children you can make two heart puzzles and race to see who can give God all their heart first.